Since 2008, the world has experienced an economic crisis of incalculable proportions, with no prospect of a solution yet in sight. There is an extremely serious crisis in the financial system, caused by the excessive liberalization of capital flows and applications, which started in the USA and spread to Europe and the rest of the world. Its backlash in developing countries was not less intense, even though each of these countries, according to its own internal capacity, tried to save itself from the announced debacle. However, it seems so far that all countries were turned adrift. The capitalist crisis of our times, or yet, the revival of capitalism through this crisis (regardless of one’s perspective) is characterized by the bankruptcy of a development model, bankruptcy expressed in the energy, climate and food crises, on the one hand, and by a deep crisis in the political systems of so-called modern democracies on the other. Something rotten is spreading through modern bourgeois democracies, and no quick or painless way to stop it can be envisaged. Nation-States have been incapable of mediating the multifarious interests of society, and are being superseded by the interests of large economic conglomerates. These conglomerates generally have the strength to impose political and economic processes at their convenience. The results of this process include the privatization of public goods, a reduced role of the State and public/private programmes (PPPs). The privatization of State and multilateral institutions are now facts.1 We are experiencing an era in which corporations exercise unchecked power over local, national and international governments. Such corporations set priorities, dictate rules and exert a strong influence on the political-economic agendas. In short, they own the market. At the same time, they destroy all that happens to be in their way. And so the policies that enforce human rights, combat inequalities and promote social justice are being ruthlessly confronted and quickly pushed away. Nowadays, it is common and ‘natural’ for corporations to have a seat at UN negotiations, acting, for instance, as advisors to the UN Secretary-General, and to actively participate in international agreements. This practice was consolidated in 2007 with the creation of the UN Global Compact, whose political strength and financial participation has increased since then.2 Meanwhile, the reverse phenomenon has occurred in terms of representativeness (and mandatory support) by Member States, which have increasingly lost decision-making capacity and power. Indeed, the UN is becoming a captive of financial corporations and is being subordinated to the interests and threats of the richest countries. It is not a coincidence that the administration of US President Trump is taking its first steps toward promoting cuts in funding for multilateral institutions, including the UN. On the political field, democratic processes are being undermined by economicism and its logic, resulting in unemployment, the gradual loss of rights won after decades of struggles, and forced migrations caused by the climate crisis and war, among others. In recent years, the countries that experienced social-democracy after a violent World War II and largely inspired the democratization and incorporation of human rights in several developing countries, have now started to experience cuts in social rights, to promote austerity policies, to close their own frontiers and to promote far-reaching discrimination. In this context, representatives of the conservative elite worldwide are taking on the governments of their countries through election processes that are questionable from a democratic standpoint; these processes include Brexit in the UK; the election of President Trump in the USA; radical religious groups in Turkey; liberal conservative governments in Europe; and a succession of coups d’état in Latin America, including countries such as Paraguay, Honduras and Brazil. In such context, what is the role of recently signed international agreements such as Rio+20, the Paris Agreement on Climate Change and the 2030 Agenda for Sustainable Development, which establish a possible international framework, as one considers the uneven correlation of forces that is emerging from the above-mentioned facts? The UN Conference on Environment and Development (the Rio de Janeiro Summit of 1992) was an important turning point for governments regarding their environmental policies and led its participants to a fundamental international political agenda for the decades that followed. It was the largest event organized by the United Nations up to that moment, attended by 179 countries and 108 Heads of State and Government in the city of Rio de Janeiro. It was considered to be a success by diplomats in Brazil and worldwide, and its results included key agreements such as Agenda 21, the Conference of the Parties on Biological Diversity and Climate, and the Kyoto Protocol and the provisions for its implementation. After the 1992 Summit, several Global Conferences took place in order to deepen and bind the countries and their peoples with a new framework for rights and a new logic about the meaning of development. For this reason, the concept of development became a point of mutual dialogue for all themes at the summits promoted by the UN. In the years after the 1992 Summit, the UN was still able to inspire a de facto global sense of political trust that allowed it to legitimately gather its member countries for several high level international meetings based on a human rights framework and approach. These meetings included conferences on human rights (in Vienna, Austria), social development (Copenhagen, Denmark), population and development (Cairo, Egypt), the condition of women (Beijing, China) and urban issues and development (Istanbul, Turkey). In the early 2000s, topics such as racism, intolerance and discrimination entered the agenda of the Durban Conference in South Africa, and the structural theme of funding for development entered the agenda of the Monterrey Conference in Mexico. We refer to this period as the Social Cycle of the United Nations. A favourable political environment was noticeable during that cycle – as long as discussions on who would pay for the transitions between different development models were kept off the table. This was indeed one of the issues that blocked all negotiations, restructured institutions and redefined the actors who make decisions at the international forums. The international institutions are still the same, but a power shift has taken place. The ‘fatigue of the international system’3 was evidenced in 2000 as the Millennium Development Goals (MDGs) were launched, along with the beginning of a new conference review cycle. The UN started to lose political power and legitimacy as an institution. This fact became noticeable over time due to the low level of government commitment and to the lack of investment by the system itself which would enable its negotiations to reach effective results. The financial crisis of the traditional governance system contributed to weakening its activities even further. Since then, both the UN System and its Member States represented have gradually lost their strength and vigour. With this process underway, their agreements and treaties became more and more a matter of discourse, with few being effectively implemented. As a result of this situation, which is referred to as ‘summit fatigue’, an entire process was left in a state of risk that was reflected in the presentation of the Millennium Development Goals (MDGs) in the year 2000. The MDGs were interpreted by social movements and global civil society organizations3 as a dramatic cutback in all that had been already achieved in terms of agreements and consensus at UN summits. The debates of almost a decade were reduced to eight goals4 and several problematic issues related to their ethical aspects, implementation and definition of responsibilities. The lack of consensus about who would pay for the bill, along with legitimacy and funding crises, had the effect of obstructing progress in relation to what had been previously debated, negotiated and agreed. Since that time, the world has endured all types of economic crises, starting in Southeast Asia and including the economies in transition in Latin America (Mexico, Brazil and Argentina) and, more recently, the developed countries themselves. Since the outset of these conferences, several social movements and civil society analysts – among them the Social Watch network – drew attention to the urgent need for a new international financial architecture, a new governance system and increased social responsibility by the Bretton Woods institutions and the World Trade Organization (WTO). These movements and analysts warned about the need to assess the social and environmental impacts of liberalizing investments in all corners of the planet, and about how essential it is to seek new development models based on sustainability, on a departure from the neoliberal economic orthodoxy and on tackling socio-environmental issues and the challenge of feeding the world population. Issues such as poverty, inequality, foreign debt, official development assistance (ODA), the need for a new financial architecture, sustainable development and a new governance system, which are always a part of the vocabulary of social movements and civil society organizations, have not met with an effective response, in part due to the fact that the UN did not have the necessary political strength to reverse international economic and financial decisions. Global policies started to be defined by the richest countries of the world in the G8 and at the World Economic Forum, and were later elaborated and implemented by the international financial institutions and the WTO. As the economic crisis severely hit the G8 countries, the world’s governance system underwent some changes and a number of developing countries were summoned to this restricted group, to meet as the G20. This is one of the new configurations that have taken shape in the world since the financial crisis of 2008. However, none of its features is directly concerned with strengthening the multilateral system spearheaded by the UN. This movement has a new governance format, and new authors are now exercising power. The weakening of the UN and its Member States by the impacts of a triple (economic, environmental and food) crisis led governments to seek answers to their economic difficulties from large transnational corporations. In turn, transnational corporations (globally known as TNCs) have sought mechanisms in different states to overcome their own problems – and many of them have been saved with public money after the 2008 crisis. Fragile multilateral institutions, in particular the International Monetary Fund (IMF) are now being rebuilt to act as the authors of this new era of financial capitalism, and to stimulate what seems to be the keynote of a new global governance, namely public-private partnerships (PPPs). The view that was rehearsed so frequently in the past is now becoming a palpable reality: globalization has given prominence to large financial and industrial corporations, by prioritizing a market-based perspective according to which national and international crises can be solved with the aid of economic leviathans. However, to secure the hegemony of this privatization process for the multilateral system and for nation-states, it was necessary to change the previous framework of legally constituted rights. Since World War II, progress on human rights has been attained with the Universal Declaration of Human Rights, followed by the International Covenant on Economic, Social and Cultural Rights (ICESCR), and, in particular, by the Social Cycle of UN conferences, which defined new generations of rights and encompassed economic, social, environmental and cultural rights, not only individual rights but also collective rights. It was thus crucial that new instruments be created so that transnational corporations could effectively exert influence and change global decisions and processes that were previously based on this far-reaching progress in terms of human rights. At that point, the UN Global Compact5 was created with the role of providing advice to the UN both under the leadership of former Secretary-Generals Kofi Annan and Ban Ki Moon, and also to the current UN Secretary-General António Guterres, from Portugal. The Global Compact took up the environmental agenda renewed at the Rio+20 Conference, along with all post-2015 discussions. It presents itself as a solution for the global problems of poverty and the climate crisis, by resorting to new types of technologies and funding options, and it defends new political and economic governance models via PPPs. The 2012 report of the Global Economic Forum stated – and this is the guideline that has been followed since then – that the governance system of the future will be better administered by coalitions of multinational corporations, governments and a select group of non-governmental organizations. According to data from the World Bank and Fortune Magazine, 110 of the 175 largest global economic entities in 2011 were corporations, with the corporate sector representing a clear majority (over 60%). The revenues of mega-corporations Royal Dutch Shell, Exxon Mobil and Walmart were larger than the GDP of 110 national economies, or more than half the world’s countries. The revenues of Royal Dutch Shell, for instance, were on par with the GDP of Norway and dwarfed the GDP of Thailand, Denmark or Venezuela.6 Such a situation leads to an amazing unbalance in the global power system and reveals the unambiguous power of these corporations in the world and in political decision-making spaces. Currently, power is highly concentrated in the private sector, which starts to drive multilateral processes and to redefine and modify previously agreed concepts. This fact became evident at the Rio+20 conference in 2012 with the introduction of concepts such as the “green economy” and the attempt to eliminate the concept of “common but differentiated responsibilities” (CBDR), which is a crucial notion for securing different levels of responsibilities among countries in efforts to combat environmental, climate and social imbalances. Such modifications already showed that a market-based view would win the dispute about the meaning of “development” and its possible paths and mechanisms. For instance, the CBDR mechanism lost one of its ‘legs’, so to speak, in this new international moment, and we now face the risk that precisely those countries that have the least responsibility for the deep global climate crisis of the present will be the ones most penalized. In this context, one of the main challenges that permeate the construction of the 2030 Agenda is the dilution of public power, both nationally and multilaterally. One of the facets of such dilution is contained in the proposals for PPPs, which are based on a narrow view of economic growth and on market solutions for sustainable development, thus depoliticizing the causes of poverty, inequality, environmental imbalance and the climate crisis. PPPs also open business entry points for corporations that hold global power: extractive industries, cutting-edge technologies, chemicals, pharmaceuticals and food and drink industries. These companies do not act in a way to promote sustainable development, but actually oppose it, since their aim is profit, instead of sustainability, and since they seek short-term gains, instead of thinking about the survival of the planet in the long run. The state’s power of mediation ends up affected, while its legitimacy is attacked, causing huge damage to human rights, since the state is the actor that has the power and the legitimacy to enforce these rights for its population. While recognizing that the global agenda is largely caught in the grips of private conglomerates, it is still important to underscore that this agenda is crucial for the ongoing efforts to cope with the serious civilizational and environmental crisis we are facing today. Despite their problems and shortcomings, the processes triggered between the 1992 Rio Summit and the 2012 Rio+20 Conference led to an international framework that contributed to the construction of consensus by Nation States around some civilizational values and the protection of rights, which cannot be disregarded. The key results of this process were the Millennium Development Goals (MDGs), the Sustainable Development Goals (SDGs), the Conferences of the Parties on Biodiversity and Climate Change, and the 2030 Agenda. The 2030 Agenda is the product of a multilateral effort to construct a possible agreement among UN Member States on sustainable development goals and targets, although some weaknesses can be pointed at in its concept and agreement. It is structured around 17 Sustainable Development Goals (SDGs), 169 targets and 230 global indicators. In spite of the fact that the UN and some governments sought to expand discussions on the 2030 Agenda with civil society participation via new communication technologies and open data tools, the present moment is characterized by a bottleneck, in which final decisions do not reflect the participation of actors invited to the global debates, and final texts do not reflect the main demands and concerns expressed by the organizations and citizens who were called to contribute their opinions. However, it must be recognized that the SDGs still represent progress in terms of commitment by UN Member States, since it fosters the implementation of wide-scope policies. Without them, the countries would not meet their chartered objectives. Yet, even acknowledging the importance of these 17 Goals and 169 targets as an agenda for the present and the future, as we consider the magnitude of the crises mentioned above, it will not be easy for UN Member States to implement them. The current spaces of power (i.e., states) lack the necessary financial and political capacity to enable implementation to take place. Moreover, the possible mechanisms for funding these Goals are even less clear. It will be difficult for the SDGs to thrive, inasmuch as they call for progressively funded and non-discriminatory policies. For this same reason, the implementation of human rights to promote justice in all areas, provided by Article 2 of the International Covenant on Economic, Social and Cultural Rights (ICESCR), has never been achieved. These 17 Goals and 169 targets have only become landmarks for the exercise of our utopias. In the real world, we observe the facts of retrogression, authoritarianism, fascism and extremism in a society of classes in which 1 percent of all individuals have access to well-being, technologies, health, education and employment, while the remaining 99 percent must face the hard facts of unemployment and discouragement. Such a system oppresses, discards and corrodes our planet and its inhabitants. It is important, therefore, to look at the Brazilian situation and ask: In the present political and economic context, will Brazil be capable to fulfill the commitments established by the 2030 Agenda? After a period of 27 years without political coups, Brazil recently experienced a new democratic disruption. According to philosopher José Antônio Moroni, member of the Executive Board of the Institute of Socioeconomic Studies (INESC),7 a political process took place in which some state institutions, political parties, mass-media outlets, churches, entrepreneurial sectors and ‘street movements’ forced the impeachment of former president Dilma Rousseff without the sufficient and necessary legal grounds. The political arrangement that led to such a break with the democratic order included the imposition of an ultra-neoliberal agenda that violates and destroys hard-won rights and social policies. The new heads of the Executive Branch, along with their strong base in the National Congress – forged via corrupt practices and the co-optation of political representatives and the Judiciary – quickly implemented a deconstruction of the already fragile democratic Rule of Law that emerged after the end of the military dictatorship in Brazil (1964-1985). The first ‘package’ delivered to the economic-financial elite that stood behind this coup was the approval of the so-called ‘cap amendment, Constitutional Amendment 95, which established a freeze of primary expenses in real terms for 20 years. Several political and economic analysts, social movements, NGOs and activists unanimously agreed in their assessments of the deep retrogression that the enactment of this Constitutional Amendment will produce in terms of rights. Popular reactions against it were also expressive, but they were blatantly ignored by the mass media and were stifled by police repression. This cycle of neoliberal reforms has advanced rapidly. The deterioration of work conditions and cuts in labour costs as solutions for resuming the accumulation of capital were secured through the quick approval of a legislative project that authorized outsourcing as a practice for all sectors and categories, which represents a deep loss of labour guarantees. The next reform of the neoliberal agenda will tackle Social Security, which has become a key piece in the strategy to constrict the role of the state and extirpate rights in Brazil. These reforms parallel other reforms currently in progress in the environmental area, which include provisions to render the environmental licensing process more flexible, review the policy that recognizes and secures Indigenous lands (to avoid additional demarcations), deconstruct the national policy of protected areas, increase flexibility and stimulate access to mineral resources, and expand land entitlement rights by foreigners, among other measures. All these reforms profess the same logic: to extend the spaces of accumulation through greater access to and appropriation of the country’s natural resources. Privatization and the unchecked dissemination of PPPs became the third element of Brazil’s new agenda. To proceed in this path, the Temer administration issued Provisional Measure 727/2016 and institutionalized the Investment Partnerships Programme (PPI). PM 727 was the second measure adopted by the current administration, and it was issued even before the end of President Rousseff’s ‘impeachment’ process. The PPI is an initiative by which the Brazilian federal administration is trying to shun its duties. It is an attempt to tread a path of no return in a privatization process with incalculable damage to Brazilian society. Behind its neoliberal project stands the vision that it is not a task of the state to invest in basic sectors such as sanitation, along with the fallacy that such resources are essential for attaining fiscal balance. Brazil’s recent past has demonstrated that privatizations do not solve the country’s fiscal problem, and that often, the bill and damage for citizens are too high. As during the Fernando Henrique Cardoso administration (1995-2002), the National Economic and Social Development Bank (BNDES) is the institution responsible for implementing the PPI. The BNDES plays the strategic role of providing long-term funding based the notion of support to strategic sectors for development, but now its main mission is reduced to structuring privatization and concession projects under the PPI, which favours financial investors. With the rationale of promoting new projects, which will emerge in the form of concessions, the government has cut environmental and human rights standards and guarantees by ordering public bodies to accelerate licensing processes for large works and projects. It is in this context of ‘producing a favourable business environment’ that the federal government is preparing a project to review its licensing processes and regulate what the PPI already does: to clear away any ‘hurdles’ (namely social, environmental, cultural and labour rights) that may either postpone or affect the profitability expected by investors. The combined and intensified effects of such reforms, budgetary cuts and privatization processes can be traced back to a clear logic: on the one hand, to reduce to a minimum the role of the state, both as a guarantor of rights and a regulator of capital; and, on the other, to reduce to a minimum the costs and provide opportunities so that capital may resume its accumulative trajectory in Brazil. In such context, the hard-won universal welfare policies secured by the 1988 Constitution, such as education and social security, are being dismantled not only as a way of cutting social expenses, but also to provide new business opportunities and create the space to enable economic groups to take hold of a considerable health and education market. At the same time, under the guise of fiscal adjustment, the few policies that still strive to break with Brazil’s historical inequalities and combat the country’s shameful situation of poverty are being either cut, eliminated or changed for the worse. Thus the ongoing processes that seek to realize rights are being cut, whereas those public institutions and policies that worked to recognize the rights of historically rejected and invisible populations are being dismantled. It is in such a complex scenario, as we seem to face a long path of consequences and resistance, that the SDGs are starting to be implemented in Brazil. And bearing this context in mind, it is indeed likely that Brazil will not be capable of adequately implementing the SDGs. Let us now take a closer look at this possibility in the light of the current process of deconstruction of the country’s already fragile welfare state. The implementation of the SDGs in Brazil is coordinated by the Governmental Secretariat of the Presidency of the Republic (SEGOV). Furthermore, Decree 8,892 of October 2016 created a National SDG Commission headed by SEGOV, as a collegiate and joint consultative body with the attribution of “supervising, internalizing, interiorizing and disseminating the execution of the 2030 Agenda”. The composition of SEGOV’s civil society members was defined on 4 April 2017 to include two members from the entrepreneurial sector, two members from NGOs, one member from unions and one member from social movements and the government. Since before the impeachment of President Rousseff, the government sought to render the SDGs and their targets compatible with its medium-term planning defined by the Brazilian Multi-Year Governmental Plan (PPA), which covers a four-year span. The PPA is the basis of the Brazilian Annual Budget and is not only the main reference for other national and sectorial plans, but is also, to a large extent, an expression of these plans. The PPA 2016-2019 is structured around 54 programmes organized by theme, and encompasses a total of 562 indicators and 1,132 goals. The current PPA emerged during the Rousseff administration to organize Brazil’s public policies and their sectors. The construction of many of these policies, particularly the ones linked to the SDGs, is based on social participation processes via Public Policy Conferences and Councils, among other participative methods, demands and political struggles. In this regard, and indeed as the current administration affirms it, a good path for implementing the SDGs is to identify their linkages with the PPA, since the PPA is the legal and institutional document that sets the governmental commitments and covers the execution of public policies, including the indicators and goals that oftentimes are closely aligned with the SDGs. One of the targets under SDG 1 – End poverty in all forms everywhere – is to “implement nationally appropriate social protection systems and measures for all, including floors, and by 2030 achieve substantial coverage of the poor and the vulnerable”. The attainment of this goal and the target is clearly linked to PPA programmes such as “Bolsa Família” (Family Stipend), “Previdência Social” (Social Security) and “Consolidação do Sistema Único de Assistência Social” (Consolidation of the Unified Social Assistance System). One of the targets under SDG 5 – Achieve gender equality and empower all women and girls – is to “eliminate all forms of violence against all women and girls in the public and private spheres, including trafficking and sexual and other types of exploitation”. The attainment of this goal and the target depends on the execution of women’s policies, particularly by a PPA programme called “Promotion of Equality and Combat to Violence”. One of the targets under SDG 15 – Sustainably manage forests, combat desertification, halt and reverse land degradation, and halt biodiversity loss – is “by 2020, promote the implementation of sustainable management of all types of forests, halt deforestation, restore degraded forests and substantially increase afforestation and reforestation globally”. The policies covered by PPA 2016-2019 under the responsibility of the Ministry of the Environment (MMA) and other bodies linked to it (Chico Mendes Institute, IBAMA and Brazil’s Forest Service, among others), and the policies for Indigenous peoples under the responsibility of the National Foundation for Indigenous Peoples (FUNAI) are essential elements in order to attain this SDG and most of its targets. The underlying issue, therefore, does not regard the inability of public policies and institutions of the Executive Branch to carry out and meet the SDGs. Instead, it regards a political-budgetary matter and is linked to the current government’s deep lack of political commitment with adequate funding via public policies defined by the PPA, which are also part of the SDGs. Such lack of commitment, in turn, is a result of Brazil’s current economic and fiscal policies, and of an attempt to dismantle the democratic Rule of Law. In this context, the implementation of most, not to say all, policies contained in the PPA – which are fundamental to attaining the SDGs – is becoming severely compromised, as the following lines will show. Constitutional Amendment 95 (EC 95), approved in December 2016, establishes a freeze of primary expenses by the federal government in real terms for 20 years, producing a deep change in the current fiscal regime. EC 95 entered into force in 2017, and its essence is the role of limiting expenses for public policies and social programmes in order to direct resources for debt repayment, thus setting a priority on the financial system, and not in Brazilian citizens. The decision to compromise the public budget and direct its resources to financial expenses is deeply linked to Brazil’s high interest rates – as a matter of fact, the highest rates of the world – and also results in high debt costs. The financial expenses related to internal and external debt, along with their interest rates, experienced a 46 percent increase between 2016 and 2017, amounting to a leap from R$381 billion to R$557 billion. In the course of one single year (from 2016 to 2017), the financial expenses’ share (interest rates, amortization and refunding) in the Budget of the Union increased from 45 percent to 53 percent, and reached R$1.85 trillion in 2017. This means an increase of R$645 billion. Meanwhile, the freeze on primary expenses resulted in a cost reduction in relative terms and reduced their share of budgetary resources. While financial expenses and their share increased in 2016-2017, the share of primary expenses was cut by 14 percent in the same period. The question emerges: from the perspective of the SDGs and of Brazil’s Multi-Year Plan, which policies are being sacrificed to secure the expenses cap and the use of additional resources to pay for the exceedingly high interest rates of the public debt? The answer is: almost all policies. Almost all policies experienced cuts in their budgetary functions in 2017. Although EC 95 does not set specific limits by budgetary function, institution or programme, data from INESC9 shows that the functions, bodies and programmes closest to the most vulnerable and least powerful segments of the population vis-à-vis the state and its structures are the ones that lost the most. 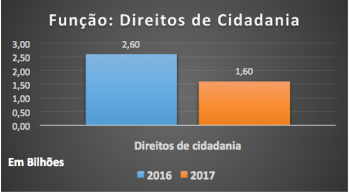 From all functions in the Budget of the Union, “Citizenship Rights” is the one that experienced the most drastic cut: 37.1 percent, as its resources were cut from R$2.6 billion in 2016 to R$1.6 billion in 2017. A striking case among the current Budgetary Functions is that of programme “Policies for Women: Tackling Violence and Fostering Autonomy”, which experienced a budgetary cut of 52 percent. It is this programme that secures, for instance, assistance to women in situations of violence. In only one year, this programme experienced a budgetary cut of R$5.5 million. How will SDG 5 on gender equality and its targets be implemented in a context of such radical budgetary cuts? It is important to highlight that the governmental body in charge of carrying out gender policies, namely the Secretariat for Women’s Policies, was dismantled and subsumed to the Ministry of Justice, and is not at all a priority for the current administration. Another important budgetary function for promoting rights is “Social Assistance”, which experienced a 5 percent cut. Specifically, its budget was cut from R$87 billion in 2016 to R$83 billion in 2017. Such a decrease considerably restricts Brazil’s ability to attain SDG 1 and eradicate poverty. There are other examples of how EC 95 will compromise the ability of the state to execute its Multi-Year Plan 2016-2019, and thus the SDGs. But it is still important to evince other constraints on Brazil’s capacity to execute its budget. Taken as a set of factors, these constraints are quickly wrecking the Brazilian Constitution itself and the policies that were structured in the democratic period that ended with the impeachment of President Rousseff. In addition to the primary expense cuts that resulted from EC 95, and amidst the worst economic crisis in the history of the country, with high unemployment rates and fast increasing poverty and inequalities levels, in late March 2017 the federal government issued Decree 9018 establishing a R$42.1 billion cut in the federal administration’s budget. Decree 9018 disallows some public expenses that could avoid the loss of rights and promote an economic recovery for the country. The contingency restrictions linked to it are publicized by the government and some mass-media outlets as a bitter medication for a situation of fiscal crisis, but they are a tailor-made fit for the administration’s lack of commitment to securing citizen rights, and, as a consequence, to the SDGs. As the following table shows, the budgetary cuts in 2017 total R$42.1 billion. These cuts were made in the discretionary expenditures of every agency and body, while their mandatory expenses, such as salaries, are preserved. However, to execute policies, it is not enough to count the employees of each institution, they must also have the appropriate resources to afford rents, electricity, telephone services, equipment purchases, gasoline, and the necessary structure for issuing public calls and carrying out their services and initiatives, among other expenses. Discretionary expenses guarantee the execution of a large number of policies in fields such as affirmative action and combatting race inequalities, Indigenous and Quilombola communities, women, youth, elders, environmental preservation, higher education policies, health vigilance and pharmaceutical assistance, among many others. The practical effects of contingency cuts such as these will be particularly felt, therefore, by the poorest segments of the population, which are precisely the ones that most need the presence of the state. A striking example of the current dismantling of Brazilian public policies can be seen in the new budgetary restrictions on the Ministry of the Environment (MMA), which has experienced a cut of 51 percent in its resources for discretionary expenses. What is the meaning of such 51 percent-cut in the discretionary resources of this ministry? The authorized budget for the MMA in 2017 is on the order of R$3.9 billion. This sum is shared among the MMA and seven other budgetary units: IBAMA, the Brazilian Forest Service, the Chico Mendes Institute (ICMBio), the National Water Agency (ANA), the National Fund for the Environment (FNMA), the National Climate Change Fund (FNMC), and the Research Institute of the Botanical Garden of Rio de Janeiro (IPJBRJ). The Chico Mendes Institute, for instance, counts with an authorized budget of R$1.2 billion. 25 percent of this sum, that is, R$316 million, is linked to expenses that may be cut due to contingency restrictions. The costs that cannot be cut are basically personnel costs. In other words, the MMA already has a small budget that is insufficient for executing its policies and managing protected areas. However, these tasks play a key role in the preservation of biodiversity and reduction of deforestation levels, both of which are targets linked to SDG 15. The ICMBio budget is utterly insufficient to secure its mission. The freeze of resources enacted by EC 95 and contingency cuts currently underway will severely jeopardize the ICMBio efforts, as well as those of the MMA as a whole. AT present, the General Social Security Regime (RGPS) and the Social Assistance Service are responsible for providing benefits to 33.5 million Brazilians, most of whom (23 million) receive a benefit equal or below the minimum wage (R$937, roughly US$297 in early May 2017). In rural areas, and under the Continuous Social Assistance Benefit (BPC), practically 100 percent of all beneficiaries receive the minimum wage floor; in urban areas, minimum wage benefits correspond to 56.7 percent of all beneficiaries. Contrary to the view currently in vogue, the values of RGPS and Social Assistance benefits are relatively low, that is, they closely follow the minimum wage value, and they represent a basic income shield against poverty. In 2015, the RGPS assisted 28.3 million direct beneficiaries. According to the Brazilian Institute of Geography and Statistics (IBGE), each direct beneficiary assists 2.5 indirect beneficiaries (family members). Therefore, the RGPS assists approximately 99 million persons, or almost half of the Brazilian population. This means that restrictive policies or polices with an effect of precluding access to retirement benefits could push up to half of the Brazilian population into situations of risk and extreme poverty. They could also have an effect of restricting the consumption capacity of half of the country’s population, with an impact on the Brazilian economy and in the national capacity to raise domestic revenues and fund development, against the commitments that were made by many countries, including Brazil. The current Social Security reform proposal also purports to gradually increase the minimum eligibility age for BPC from 65 to 70 years. This important social protection mechanism currently assists 4.5 million people and secures a monthly citizen income equivalent to the minimum wage for senior citizens (aged 65 or more) and persons with disabilities and a monthly family income below a quarter of the minimum wage. The BPC is therefore a protection for all persons who live in a situation of extreme poverty and are incapable of securing their survival via paid work, either due to their advanced age or to limitations in connection with disabilities. Due to their broad coverage among the elderly population, the RGPS and BPC benefits expanded the income guarantee for over 80 percent of all senior citizens, thus reducing poverty in their age group. In 2014, only 8.76 percent of all persons aged 65 or older were living with an income below or equal to half the minimum wage – a datum that shows how poverty is virtually residual in the senior age group in Brazil. If Social Security and the BPC ceased to exist (as proposed by the Social Security reform of EC 287), the percentage of poor senior citizens at age 75 would surpass 65 percent of the entire elderly population.10 The discontinuance of these two important benefits would prevent the attainment of SDG 1 and the eradication of poverty. In a few words, it will not be possible to implement the Sustainable Development Goals (SDGs) in Brazil. This sad prospect is a consequence of the lack of the necessary budgetary allocations, resulting from the current austerity policies of the Temer administration. Such policies establish a cap for social expenses and promote budgetary cuts of over 50 percent in many governmental bodies, along with other reforms that lead to social exclusion, increase inequalities and relinquish the national wealth via privatization processes. The current positions expressed by Brazil at UN meetings demonstrate these facts: 1) Brazil has voted against the drafting of a report on the effects of austerity measures for human rights at a meeting of the Human Rights Commission in March 2017; and 2) Brazil did not support the draft text containing fiscal justice suggestions for attaining women’s rights at the 61st session of the Commission on the Status of Women in March 2017. We are facing an imposed and illegitimate Brazilian government that promotes actions and sets up makeshift devices on behalf of the SDGs to justify its commitments internationally, while it is rendering these same SDGs unattainable as a result of its political and economic decisions. We are indeed facing dark times in the present and in our prospects of a future for Brazil, for the region and globally. In this context, the SDGs are a minimum reference – with a rugged path ahead. 1 Barbara Adams and Jens Martens. Fit for whose purpose? Private funding and corporate influence in the United Nations. Germany/USA: Global Policy Forum, 2015. 2 Ibid., Ch. 3b, “The UN Global Compact”, p.38, chart 9. 3 Átila Roque and Sonia Corrêa. “Das Cúpulas às bases: Cenário internacional.” In Social Watch, Observatório da Cidadania nº 4, 2000, available at: http://www.socialwatch.org/node/11315. 4 See the collection of reports produced by Social Watch, available at http:/www.socialwatch.org. 6 Lou Pingeot, “Corporate influence in the Post-2015 process”, Global Policy Forum, January 2014. 7 Interview with Le Monde Diplomatique, 27 April 2017. Available at: http://www.inesc.org.br/noticias/ noticias-gerais/2017/abril/a-desconstituicao-etica-moral-cultural-e-institucional-do-estado. 10 Previdência: reformar para excluir? Contribuição técnica ao debate sobre a reforma da previdência social brasileira. Brasilia: ANFIP/DIEESE, 2017, 212p.